Renovation and renewal are the cornerstones of Phase II of the UFV Canada Education campus, helping to redefine the buildings and bring a new vision the university. 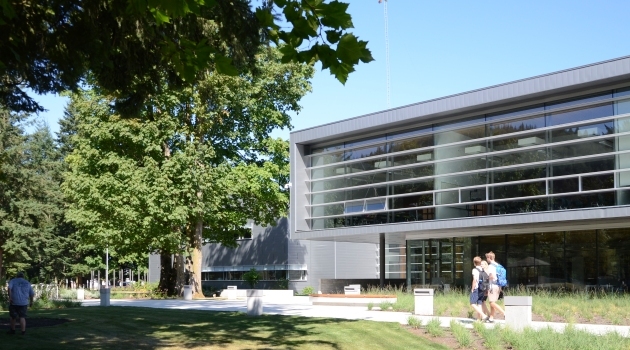 Having previously been built as a military engineering school, the challenge was to repurpose, renovate, and expand this building to create an exciting and vibrant new campus for UFV; one that expressed the future and value implicit in the UFV vision. Joining the university on its journey over the past three years has been Stantec, an integrated architectural and engineering firm with offices across B.C. “Given that this was a renovation project, it was vital that we work closely with students, faculty, staff, and other users to define their vision of the new campus,” said Darren Burns, Principal, who oversaw the project on behalf of Stantec. Stantec’s contribution to the project includes architecture, interior design, mechanical engineering, electrical engineering, civil engineering, structural engineering (in conjunction with Equilibrium Consulting Inc.) and landscape architecture. The result is a new campus that boasts kinesiology, early childhood education, dental and nursing labs, classrooms, offices, a performing arts studio theatre, library, student union, and an aboriginal gathering hall. “In order to achieve the results we have today, we took a collaborative approach. At Stantec, we are fortunate to have a varied range of experience and expertise within our team,” Burns added.Phase II of the UFV Canada Education Park boasts not only an integrated and cohesive campus, but the new buildings also have been registered LEED® Gold status, with certification to follow after occupancy. LEED® certification is an internationally recognized benchmark for green building design, construction and sustainability. Managed by the Canada Green Building Council, LEED® outlines new construction guidelines and measures results using a point-system in six areas — sustainable sites, materials and resources, water efficiency, indoor environmental quality, energy and atmosphere and innovation. Looking ahead, Stantec is excited about seeing the new Canada Education Park Phase II campus building come to life when students and faculty begin using it this Fall. This article originally appeared as part of a UFV on the Move supplement in the Chilliwack Progress.